Offensive Tweets Remind Major Leaguers That On Social Media, The Past Is Never Past Sean Newcomb nearly pitched a no-hitter, but it was his years-old tweets that drew headlines. He's not alone: Several MLB players have seen past homophobic and racial slurs resurface recently. 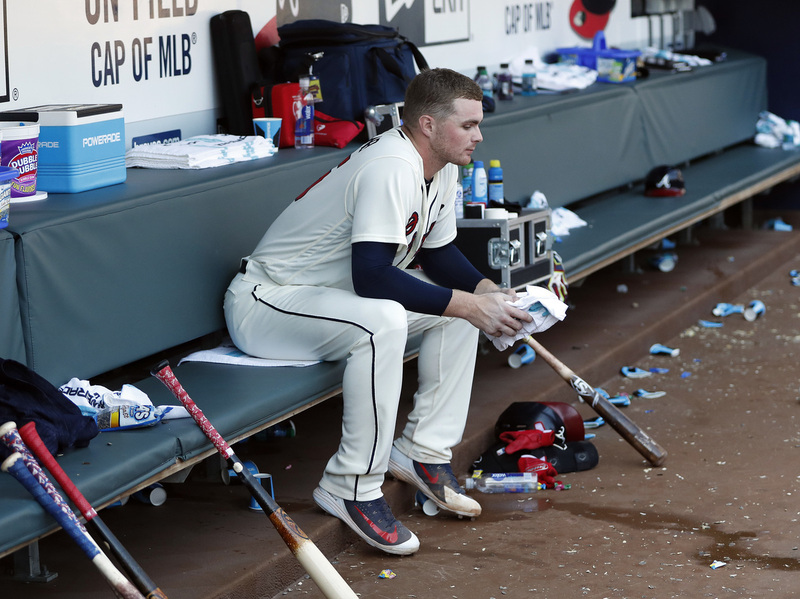 Atlanta Braves pitcher Sean Newcomb takes a seat on the bench after losing his bid for a no-hitter in the ninth inning Sunday. Shortly after that home game against the Los Angeles Dodgers, the Braves released a statement calling Newcomb's old tweets "hurtful and incredibly disappointing." "I just wanted to apologize for any insensitive material," Newcomb told reporters shortly after Sunday's game, according to The Associated Press. "It was a long time ago, six or seven years ago, saying some stupid stuff with friends." Newcomb's apology for his conduct on social media wasn't the first such sorry uttered by a major leaguer in recent weeks — or even the last that day. Milwaukee Brewers reliever Josh Hader's own inflammatory tweets surfaced earlier this month while he pitched in the MLB All-Star Game. The league did not fine or suspend Hader, 24, for his racist and homophobic language, which was also posted on Twitter in 2011 and 2012. Rather, officials mandated that Hader, who publicly apologized, undergo "sensitivity training" and MLB "diversity and inclusion initiatives." 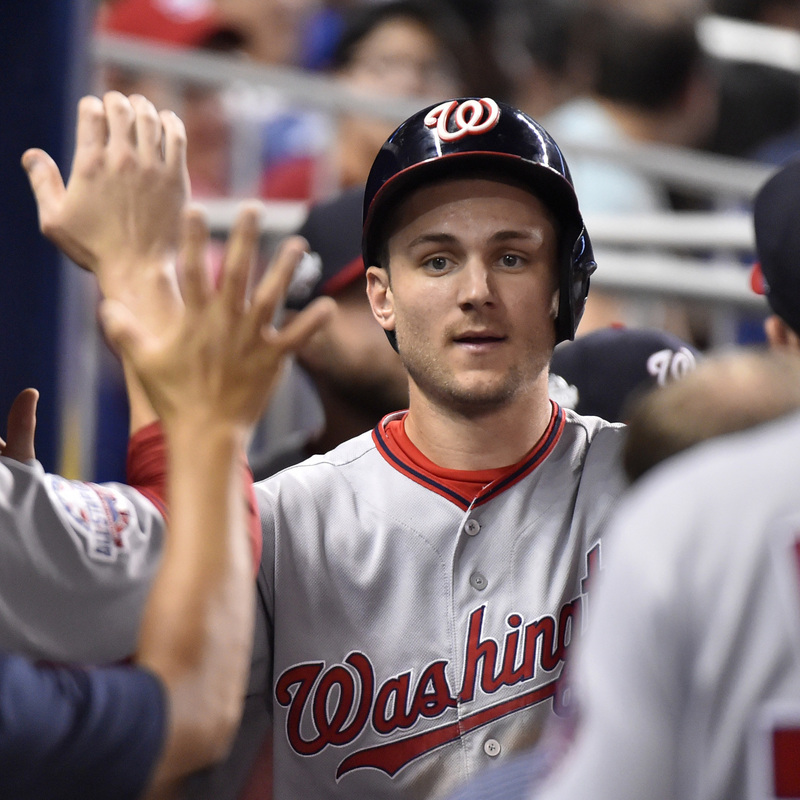 By Sunday evening, the cycle of outrage and apology had reached Washington Nationals shortstop Trea Turner, 25, who also found his own years-old, ugly comments recirculating on social media after Newcomb's. Turner's tweets — also posted in 2011 and 2012 — used similarly derogatory language toward black and LGBT people. "There are no excuses for my insensitive and offensive language on Twitter. I am sincerely sorry for those tweets and apologize wholeheartedly," Turner said Sunday in a statement emailed to NPR by the Nationals organization. "I believe people who know me understand those regrettable actions do not reflect my values or who I am." Mike Rizzo, the Nationals' general manager and president of baseball operations, called Turner's tweets "inexcusable," noting that the organization "does not condone discrimination in any form." Nevertheless, Rizzo voiced confidence in Turner's recent behavior. "Trea has been a good teammate and model citizen in our clubhouse," Rizzo said in a statement, "and these comments are not indicative of how he has conducted himself while part of our team."